I have to tell you about this great Thanksgiving ebook that Comfy in the Kitchen and The Better Mom are offering... for FREE! I downloaded it yesterday and it is amazing!!! So many great recipes and perfect for the holidays. If you're like me... you'll want to print them all. They have included pictures of each recipe as well as photos of 'how-to' along the way. I made the Thanksgiving Ham last year for Christmas and my family loved it! 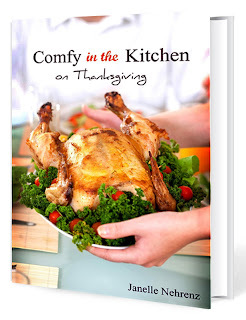 Click on this link to download "Comfy in the Kitchen on Thanksgiving"
Then... click on the link at the end of their post. Please... take a minute to look around at these great blogs. Comfy in the Kitchen is my favorite blog for recipes. Janelle has many great recipes to choose from. She has photos of every recipe and includes all the steps along the way. Beautifully done. I'm sure it will become a favorite of yours as well. The Better Mom is a great place to learn how to be.... well, a better mom. Who couldn't use more tips like that? Everything from meal planning to organization is offered here. Check it out. I'm sure you'll find something useful. Both of these blogs are written by women who have a heart for the Lord and are willing to share what they know with others. They are both favorites of mine. When you find something good.... you just have to share it. You're welcome! After I printed my own copy I just had to pass it along. Love it!